I want to clear the record. In retrospect, I know now, why circumstances were as they were. These poetic failures were the result of youth, of a certain naiveté, of the grandest of all illusions, that is, of believing, despite results that suggested otherwise, that these very poetic failures, along with a profundity of thought, would lure my love to me and keep him there. I know now that nothing written will bring love. Love comes when you abandon the delusion, when you realize that you can proceed, even creatively, without it. Your life and happiness are worth more than your sufferings. These poems do indeed explore a youth that Boully says are “the papers of a life not mine, no longer mine.” Their titles indicate that she is reflecting, pondering really, with the lushest of language, on love that did not happen, on love that she is “pining” for, but that has not reached her the way she would like it to. The first poem of the book, “Today, No One Has Come to Propose,” begins with the following lines: “The palm-reader never asks what I should like; / nor in my lateness, can I request my kind of dying.” Boully writes admirably well about the misgivings of her youth. She employs the most metaphorical language to make, with wry humor at times, a book of poems that is both enjoyable and painful to read, because of its subject matter. This is a searching book, a book that wants to find the necessary, but this “necessary” is elusive, and the book’s speaker/narrator doesn’t always give us the clues we need to pin it down. And is it necessary? That remains to be seen, for many of the poems are deeply-felt desires that seem to be deeply pained by the thought of finding. Caught in the belly of a whale within a turgid sea and among me the sorry remains of little fish. There is no color for blood. (You see, the island will be full of strange foreboding.) Even from the inside, I still do not know the structure of the animal’s bones or the location of ambergris. These poems do what Boully does best (I highly recommend her other books, too): they explore the terrain of an interior while not giving up entirely to images that can’t be grounded in the physical world. She can make high school drama, watching films (as her book is landscape-oriented, in terms of shots by a camera), and Williamsburg, Brooklyn, seem to be places and things that are full of complications, but not in a way that we all haven’t felt at some time. Boully’s afterword tells us that “these poems chronicle, more often than not, the failures of love, but I invite the reader to witness them also as creative sufferings, the failures of creative endeavor to culminate into anything substantive or worthwhile.” With this humility as a grounding place, we enter these poems to be changed by their kind heart, and, indeed, are. 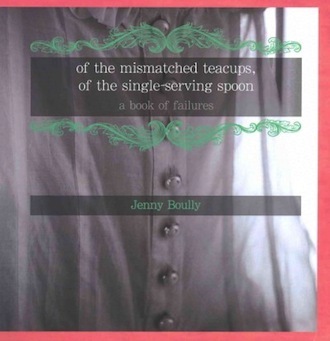 of the mismatched teacups, of the single-serving spoon: a book of failures is available from Coconut Books.